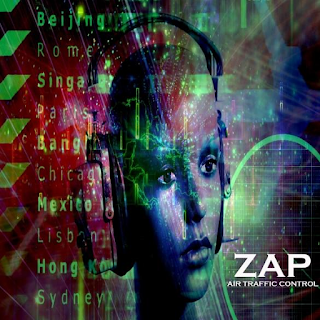 Chicago, IL - New band ZAP has released a digital single called “Air Traffic Control” on Steve Vai's Favored Nations label. The band is made up of Emmy-nominated composer Sean McKee, who is also collaborating with Jon Anderson from YES on a concept album project, Ike Willis, the voice on numerous Frank Zappa albums, and Grammy-nominated bassist Chip Z'Nuff (Enuff Z'Nuff, Missing Persons, Adler's Appetite). “Air Traffic Control” started as a 60 second piece that was commissioned by Lee Abrams (Co-Founder of XM Radio) to have McKee write a piece of music in the style of Frank Zappa, and produce a video to commemorate the 20th anniversary of his passing. McKee wrote and performed all instruments, including recording the keyboard parts using a then-prototype Lineage MIDI guitar from Inspired Instruments. Besides being a musician, McKee is known as a pioneer in the field of image processing, creating technology used for new movies and classic film restorations, along with 2D to 3D conversions, with the technology he led development on being used daily in Hollywood. For several years, one of his clients was Gail Zappa, Frank's widow, and he worked on restoring film elements from Frank's archive, and also helped to recover lost video masters that Gail hadn't seen in years. McKee crafted the song starting from the existing 60 second guitar solo, building a complete song around it, similar to methods Zappa incorporated. He then asked Ike Willis to sing on the track and add another guitar solo. Die hard Zappa fans will also notice a lyrical reference to the infamous 'White Zone'. McKee then asked Chip Z'Nuff to play bass on all parts except for the bass under the solos, which McKee had recorded originally. The end result is a modern interpretation and homage to a timeless and unique style.